EnjoyaBowls' vision is to make lively food, fresh from scratch daily and offer it in a fast-casual restaurant environment. They use many non-GMO, organic, all-natural, preservative free ingredients and offer a tempting menu that is easily adaptable to gluten free, dairy free, meat free, and soy free diets. 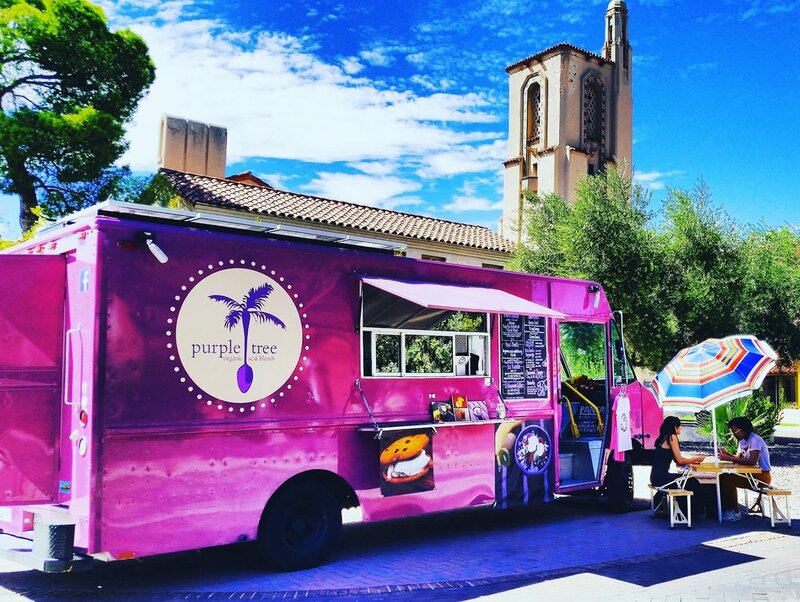 Food truck and catering based in Tucson, AZ focused on local and seasonal ingredients. The entrees change daily to reflect produce in-season, but offerings generally include updated Sonoran-inspired comfort foods. Isabella's Ice Cream is founded upon the principal of being socially and environmentally responsible. Every one of their ice creams is lovingly made in their family-owned downtown creamery. They only use the freshest, local ingredients that are non-GMO certified. [POPPED] Artisan Popcorn is proud to offer non-GMO popcorn that is gluten, nut, and dairy free! They use absolutely no preservatives and no artificial flavors or colors. All of their flavors are totally vegan! Presta Coffee Roasters is a local, micro coffee roaster. They carefully roast each batch to create delicious and consistent coffee. They'll be bringing their coffee van to the market! Purple Tree Organic Açaí blends are yummy blends of pureed organic açaí palm fruit prepared with granola, a variety of juicy fruit toppings, and locally sourced honey. They also offer savory soups, organic coffee, tea, hot chocolate, and a variety of vegan/GF baked goodies! We're excited to announce alcoholic beverages will be available for purchase at the market for those ages 21+ over, including beer, wine, mezcal cocktails, and other speciality beverages. 25% of these proceeds go to our spotlight non-profit, Desert Survivors. Exo is a cafe, work space, bar and venue that aims to serve the producers that make our products. They source local produce as much as possible. They work closely with farmers and producers of coffee and mezcal in Mexico. The bar provides music and craft cocktails with a focus on mezcal. Located in Downtown Tucson, Pueblo Vida Brewing Company creates an authentic beer drinking experience by brewing unique and world inspired beer styles that are locally crafted with the highest quality ingredients. Their passion is brewing. They strive for quality, uniqueness, and repeatability. The beautifully rugged high desert land provides potential for their vines - the vines must struggle, drawing from the terroir - the wind, the dramatic temperature swings, the limestone subsoils, the clear skies and the rumbling summer storms. From these grapes the winemaker, Rob Hammelman, drew out the expression of this land for their first vintage in 2010.